The Traditional Hawaiian Luau experience that recaptures the "Spirit of Old Hawaii"
Let us take you back 100 years & 27 miles from Waikiki to their exclusive beachfront property on the shores of West Oahu. Since 1976, over 3 million visitors to our Islands have become a part of our Ohana. Acclaimed as America’s Best Luau in "America’s Best 100" and has been filmed by ABC's "Good Morning America". 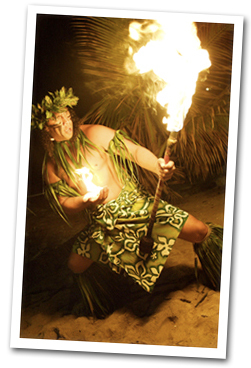 Come to where you will still experience a traditional luau that recaptures the "Spirit of Old Hawaii". You will leave with fond memories of what a true luau is all about…a one of a kind experience not found anywhere else in the world. Upon arrival, all guests are traditionally welcomed with a Hawaiian Shell Lei. The sounding of the conch shell announces the beginning of the evening's festivities! Picture taking opportunities await as the Royal Court of Polynesia makes its entrance. As the imu (underground oven) is uncovered, the savory aroma of the Kalua Pua'a (roasted pig) – your main course of the evening – reminds us that dinner is soon to be served. The all-you-can-eat buffet features an array of tasty Hawaiian – American selections, which include traditional Island favorites sure to please even the less adventurous. 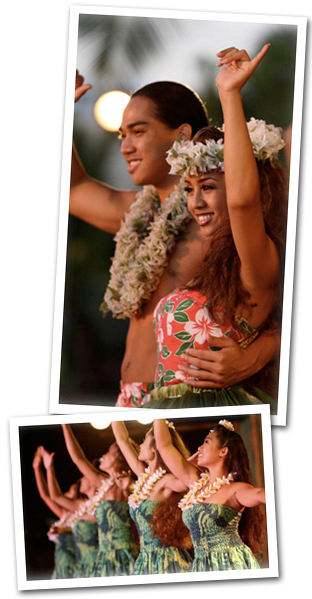 The night is filled with beauty, color, and excitement as our multi-talented kane (men) and wahine (women) take you through a non-stop, action-packed journey throughout the Islands of Tahiti, Samoa, New Zealand as well as the romantic hula of Hawaii. This Luau is available Tuesday through Sunday. Closed on Mondays. Attire: We suggest a light jacket and comfortable shoes with casual Aloha attire, i.e. a casual Aloha shirt and jeans or shorts. Special Menu Options for Vegetarians, Gluten-free diets, or other special dietary needs: We can order a special “stir fry” dish for you with advanced notice. Then you can go down our buffet line to select any other dish that you may desire. Must reserve 48 hours in advance. Children: We do not charge for children 3 years and under. We ask that you have them sit on your lap on the bus if there are no extra seats. At the luau, they are able to sit in their own seat and are given a small plate for the dinner buffet. Unlimited soft drinks are also available. Please bring your own baby carrier or stroller as we do not have any high chairs at the luau. Strollers: Strollers are allowed at luau. Please note, because the luau is on beach you will have to pull the stroller through the sand. Type of Seating: The majority of our tables are picnic style benches. If you require a chair with a back, please contact us and we will arrange to have one for you. Special Accommodations: The luau is wheelchair accessible/ Although our luau is on the beach, we do have some areas where the sand is more compact. With the assistance of your party, you are able to access this area. We discourage bringing motorized scooters since several have been damaged in the past due to sand getting into the motor. Luau will not be held responsible for any damage. Please contact us as soon as possible if you are bringing a wheelchair on the bus as we may need to reserve a specialized vehicle with our transportation company and these special buses are not always available.